Use this early booking code below at checkout for $50 off!! ALL BOOKING IS DONE ONLINE! ​Click on "Book Now" button above! 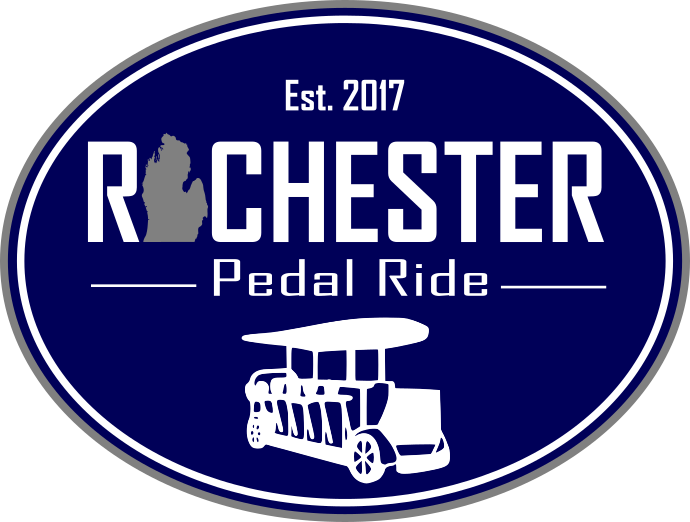 Cruise around downtown Rochester, Michigan in our 15 passenger pedal bike, and experience the ride of a lifetime aboard one of the largest bicycles ever built. Bring your friends to enjoy "people powered" entertainment at its finest. Rochester Pedal Ride brings a new and unique way to celebrate a birthday, graduation, bachelorette/bachelor party, Happy Hour, Sunday Funday, Date Night, Wedding Event, Happy Hour, Team Building Event, Big Bright Light Show Tour, or just a good night out with friends. ​adventures begin with Rochester Pedal Ride! Our rides run for a total of 2 hours. Riders will pedal about 3-5 miles around Rochester and will usually make two stops at local establishments along the ride. Rochester Pedal Ride can also be booked for a longer ride, or even an entire day to support your group or private event if needed. Just ask and we can work with you. How Many people does it hold? Our bike holds a total of 15 passengers. There are 10-pedaling seats, plus 2-non-pedaling seats located over the rear axle. The rear non-pedaling bench seats 3 average size passengers. 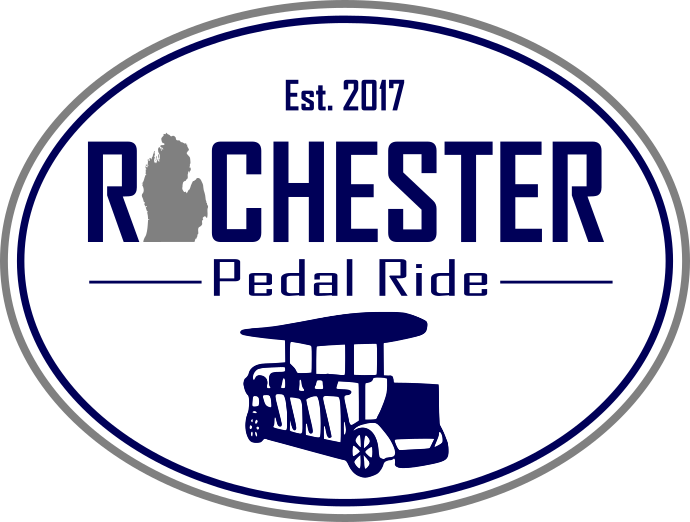 ​​**We recommend a minimum of 10-passengers to rent Rochester Pedal Ride. ​​what is the Alcohol policy? According to Senate Bill 0165 passed in July 2015, alcohol can be consumed on quadricylces in the state of Michigan. All riders MUST be 21 if alcohol is present on the bike. Drinking beer/cocktails/wine in cans or plastic bottles is allowed! No glass at all! If you're drinking mixed drinks or anything NOT in a can, you MUST bring it on the bike in a travel style cup like a Yeti, Tervis, etc. The riders must be 9 years of age or older to ride the bike and all riders under 12 MUST bring/wear their own helmet. Anyone younger than 18-years of age, must have their waiver signed by a parent or guardian that is able to accept responsibility for the underage person and is authorized to sign the Liability Waiver on their behalf. Again, if anyone on the pedal is bike is under the age of 21, alcohol will not be permitted on the bike. The bike seats have a weight capacity of 300 lbs. and we ask that you honor this capacity to ensure your personal safety. What if the weather conditions are poor? We ride rain or shine, so dress accordingly! Rochester Pedal Ride reserves the right to cancel a ride due to dangerous weather and issue a rain check. There will be no rain checks offered once the tour starts. What is the late policy? We will do everything in our power to make sure you end your ride on time. Late Return Fees may be charged following the tour at the discretion of Rochester Pedal Ride team members. It is JUST like riding a bike, so make sure you wear appropriate shoes and clothing. Sure! You'll have a few minutes before your ride begins to decorate. We just ask that you only use blue painter's tape because regular tape can peel the finish off of the bike. Please make sure you dispose of all of the decorations that you use before you leave. We are booked back to back and need the bike ready to go for the next group. Thanks a bunch! ​​Your driver will go over the rules and behavior expectations at the beginning of each ride, most of which are outlined within the Liability Waiver. Every rider MUST fill out a liability waiver and show photo ID before ride can start! All riders must drink beverages out of cans or travel/reusable style cups (Yetis, Travel coffee cups, canteen bottles, water bottles, etc) No glass bottles at all! Please realize that our business is very visible to the public and people of all ages witness the Rochester Pedal Ride entertainment experience. With that said, all passengers must conduct themselves in a mature and moral manner. We want you to have a great entertainment experience, while respecting the rights of the public. Please refrain from any profane language, heckling or lewd gestures to anyone on the bike or anyone you may encounter on the street. Please provide an appropriate musical play-list with no profanity, as this music can also be heard by the public. Please respect each other! Failure to conduct yourself in a mature manner will result in the staff stopping the tour and addressing the concern with the individual. If the action persists, the passenger responsible for the inappropriate behavior will be asked to immediately leave the bike and will be responsible to secure their own transportation. A disciplinary charge of $250 may then be charged to the credit card on record. Rochester Pedal Ride is a great entertainment experience and we want to continue to offer this experience in Rochester for many years to come. Please help us be good neighbors and let’s all have a great time! What if i can't pedal? No problem! Though pedaling on a Megacycle bike is an exciting part of the experience, 4 of the 15 seats are non-pedaling spots. If your health does not permit you to pedal, these 5 spots are for you. If you are pedaling and need a break, we can pull over and rotate your riders to allow you to take a non-pedal seat. We can also stop at any bar along the way, to allow your group a break. We do have supplemental electric power to allow us to assist through intersections and make emergency traffic maneuvers, if necessary. It is NOT intended to replace pedaling! Please remember, this is a pedal bike and pedaling is a major part of the entertainment experience. What is the waiver requirement? A SIGNED LIABILITY WAIVER IS REQUIRED TO RIDE! ​Just like riding on any bike, riding on the Rochester Pedal Ride can be potentially dangerous. It is suggested that you wear helmets for your safety. You do not have to wear one – it is up to you, however, you must notify us in the Liability Waiver that you are NOT wishing to wear a helmet. You take responsibility for your decisions and behavior!! Where does the ride start and end? Our starting and ending zone for our rides takes place in the alley behind Bizzy Bee Artisan Market. The address is 409 S. Main Street, Rochester, MI. The new public parking garage is available right next to the alley. For more parking areas click HERE. Meter parking ends at 9:00 PM and parking is free on Sundays. We have had several people ask about starting and ending at other locations and unfortunately, we can't change our start/end location. If you had a great time, please consider tipping your Rochester Pedal Ride driver the customary amount of 20%. Your driver works hard to make sure you have a fabulous time while aboard Rochester Pedal Ride. If you did not, please immediately email us at rochesterpedalride@yahoo.com and share your experience with us. Without your help, we cannot improve your future Rochester Pedal Ride experiences. ​**We also hope you tip your servers at the locations we visit on the tour. ​Thank you for pedaling with Rochester Pedal Ride! Can I choose my own stops? We worked very closely with the Rochester Police Department to come up with a route that has many options on it. We are sure you'll find stops that you like! We take traffic safety very seriously and have coordinated safe routes with the Rochester Police Department. ​We ask that you please follow pub etiquette so that Rochester Pedal Ride riders are always welcome! 1. Pay in cash or have a few people pay with credit cards during your stops. Having to use 14 different credit cards each stop will hold up your group and will result in less time on the bike during your tour. 2. Please be patient and respect the other restaurant/bar patrons. BEVERAGES - (You may bring alcohol in cans/plastic containers on the bike and drink out of them. If you're drinking anything that doesn't originally come in a plastic container or can, you must bring it on the bike in a travel style cup/container. No glass is allowed on the bike at all. How does A ride work? Can I book longer than 2 hours? Our regular rides are 2 hours in length. If you'd like to add more time, please email us at rochesterpedalride@yahoo.com and we can try to figure something out with you! ​"Life is a beautiful ride!"